There are several reasons why you should choose kids electric toothbrush over regular electric toothbrush – regular toothbrush can be too big, vibrations too powerful, and sound too loud. Keeping all that in mind Philips Sonicare designed the Philips Sonicare for Kids children electric toothbrush. Scientists have discovered that children who use electric toothbrushes have cleaner teeth. They say that children brushing with electric toothbrush remove up to 75% more plaque in several areas of the mouth than using the manual toothbrush. It sounds like a difference. So should you just give your kid your Philips Sonic tooth brush? Wait a minute. It might be too much for a little kid. I wrote this review about the HX6311/02 model of this toothbrush. Since then Philips has released 2 updated models – the HX6311/07 model in 2014 and HX6321/02 Bluetooth model in 2018. The new model has the same features, but the design and replacement brush head have been updated. I will address the differences between these products further in the article. If you will give your kid this brush and tell him to brush for full 2 minutes, this will be the last time he or she uses the electric toothbrush. Children should slowly get used to brushing with the electric brush. KidTimer progressively increases cleaning time and power over a 90 day period, so that kids get used to buzzing and tingling sensation. 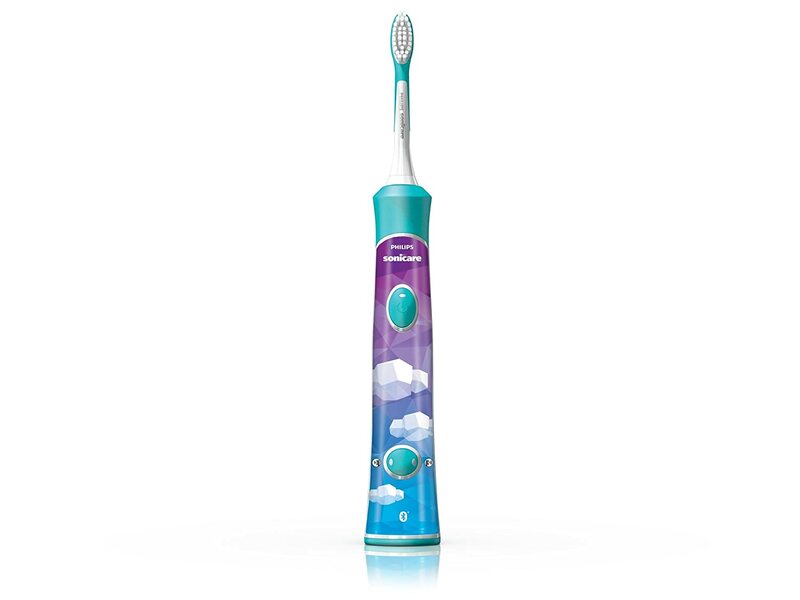 To provide gentle cleaning HX6311/02 kids electric toothbrush has 2 power modes – Low for ages 4-7 and High for ages 7-10. These power settings are 60% and 40% less powerful than regular Sonicare Essence mode. That is also the reason why this kids toothbrush is noticeably quieter than regular FlexCare. The musical tone informs when you should switch to another side of your teeth. Small brushing head with softer bristles cleans gently and protects kids teeth while they are learning correctly using the electric toothbrush. Philips Sonicare for Kids HX6311/02 toothbrush comes with 3 interchangeable color panels. This toothbrush is not a water-down version of a Sonicare. It has all advanced features of an ‘adult’ Sonicare toothbrush. It is getting outstanding ratings from Amazon.com’s customers. 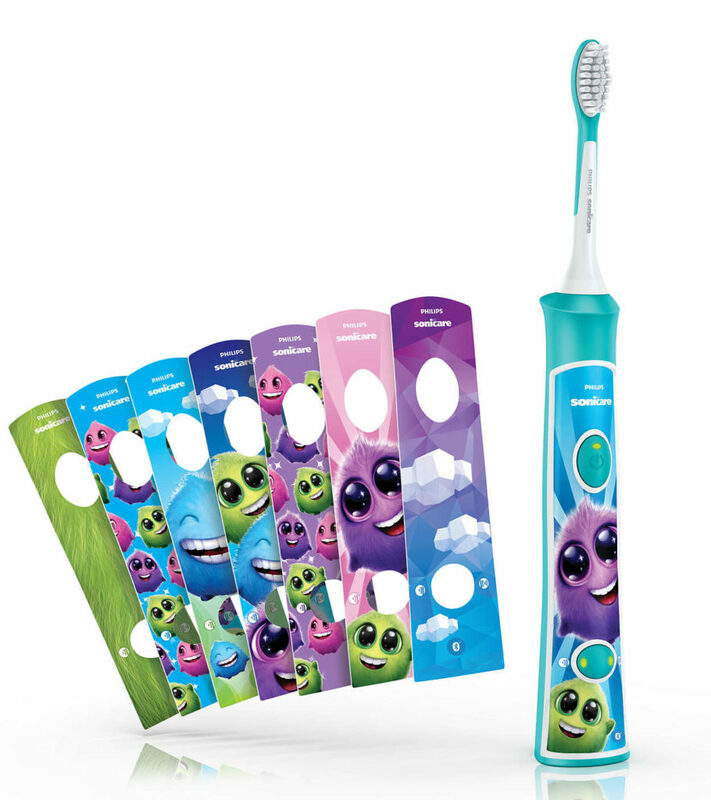 have been designed for growing kids in the 4-7 age group to encourage healthy brushing habits. Just show your kids how to brush, and the Sonicare brush will deliver excellent results, even when kids will start cleaning on their own. Children love their Sonicare brushes that make brushing teeth a fun game. HX6032/60 brushing heads feature soft bristles that are gentle on children teeth and developing gums as well as a rubber overmold that protects sensitive teeth. There are two brush heads in the pack – one red and one blue. have been designed for growing kids in the 7-10 age group. 1 charger base with brush head storage.